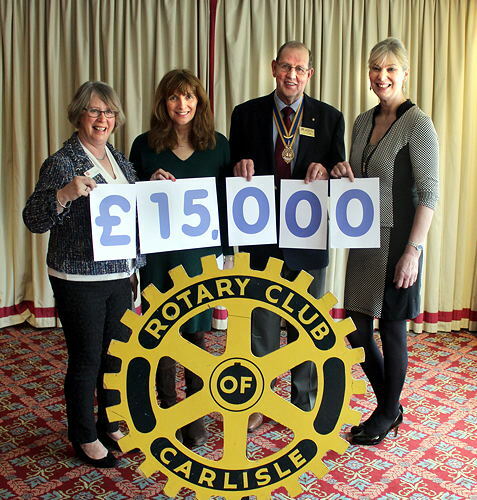 Ian Watson, President of The Rotary Club of Carlisle presented cheques totalling £15,000 to charity following the successful The Farmers & Farmers’ Wives Choir concert at The Sands Centre, Carlisle in January. The charities sharing the proceeds are Meningitis Now and Eden Valley Hospice, nominated by the Rotary Club of Carlisle, and Macmillan Cancer Support and Motor Neurone Disease Association, nominated by the choir who gave their services free of charge. Over 800 people attended the concert at The Sands and, in addition, there were 56 people and businesses that generously sponsored the event. 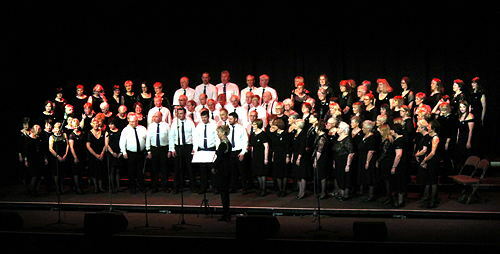 The choir of 100 farmers and their wives was formed in September 2013 drawing people from all over the South of Scotland and since then they have performed mostly in Scotland under the direction of Kate Picken, a farmer’s wife and music teacher from Kirkcudbright, raising over £33,000 for charity. The singers were brought to Carlisle by retired Cumbrian dairy and beef farmer Ian Watson after hearing the choir perform. Half the proceeds have been shared between charities close to Ian’s heart, Meningitis Now and Eden Valley Hospice while the other half will be shared between the choir’s chosen charities, Macmillan Cancer Support and Motor Neurone Disease Association. Without the enthusiasm and dedication of Ian and his wife Barbara the whole event would not have been possible. They are due a huge vote of thanks from everyone who attended the concert and the charities which together will benefit from the £15,000 raised.